oatmeal | Healthy Product Reviews!! Ohhh how I lovee oatmeal. It really is the perfect breakfast food- you can play it up any way you want. Add fruit, peanut butter, yogurt, milk, maple syrup, chocolate chips… Or, even plain jane style with a pat of all natural butter and a sprinkle of sugar on top. It really warms and fills you up and gives you plenty of energy. But- what about those days you just don’t have time to cook good ol’ Quaker over the stove top? That’s usually where Instant oatmeal comes in. Boil some water, pour, stir, enjoy. Or, for those of you who don’t have ANY time to spare (or you lazy-bones out there 😛 ), the microwave helps. However, usually instant oatmeal leaves me unsatisfied. The portion is tiny, the sugar content is high, and it’s just not as good. Nature’s Path oatmeal comes in several varieties, but I tried the Maple Nut, Apple Cinnamon and Multigrain Raisin Spice that comes in the variety pack. It also comes in Flax Plus, but I have yet to try that flavor. What I was first happy about was that each packet has more than traditional oatmeal packets have. The Nature’s Path brand provides 50g of oatmeal as compared to 30g that I normally see. You can tell it gives you more too when you pour it in the bowl- a nice change. 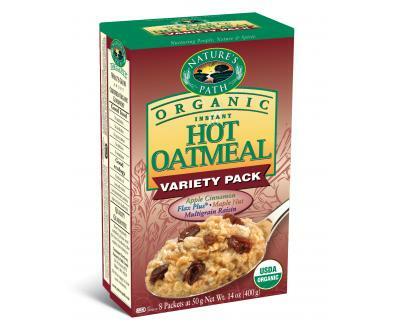 Overall, a pleasant experience with Nature’s Path Instant Hot Oatmeal. I’ll give it 4 stars all together. They provide you with a little more sustenance than traditional instant oatmeal, and are really good paired with some toast & peanut butter or jam, some fruit, or both for a nutritious breakfast (or pre-workout meal like I did!!). I want to try more of their flavors, like the Optimum Brand in Cranberry Ginger. Yum! Maple Nut & Apple Cinnamon- 1 packet is 210 calories, 2.5-4 grams of fat, 38-40 carbohydrates, 4 grams of fiber, 5 grams of protein. Multigrain-Raisin Spice- 1 packet is 180 calories, 1 gram of fat, 39 carbohydrates, 4 grams of fiber, 4 grams of protein. Maple Nut-Organic rolled oats, organic evaporated cane juice, organic hazelnuts, natural flavor, sea salt. Apple Cinnamon-Organic rolled oats, organic evaporated cane juice, organic dried apple, organic cinnamon, sea salt, natural flavor. Multi-grain Raisin Spice-Organic rolled oats, organic wheat flakes, organic evaporated cane juice, organic raisins (coated with organic sunflower oil), organic brown rice flour, organic corn meal, organic cinnamon, sea salt. Hey you know what goes good with oatmeal? APPLESAUCE! enter this giveaway now!! Also- how do you like your oatmeal? rolled oats? Instant? What’s your favorite brand!? Looking for a delicious, gluten and food allergy free cookie? Well, your searching ends here my friends, I found some DELICIOUS, gluten, milk, egg, peanut and almond free cookies. They are developed by Dr. Lucy, who is an M.D. and a mother of a child who has very bad allergies. She says, “I know how difficult it can be to find high-quality foods that taste great. That’s why I started my own line of cookies”. 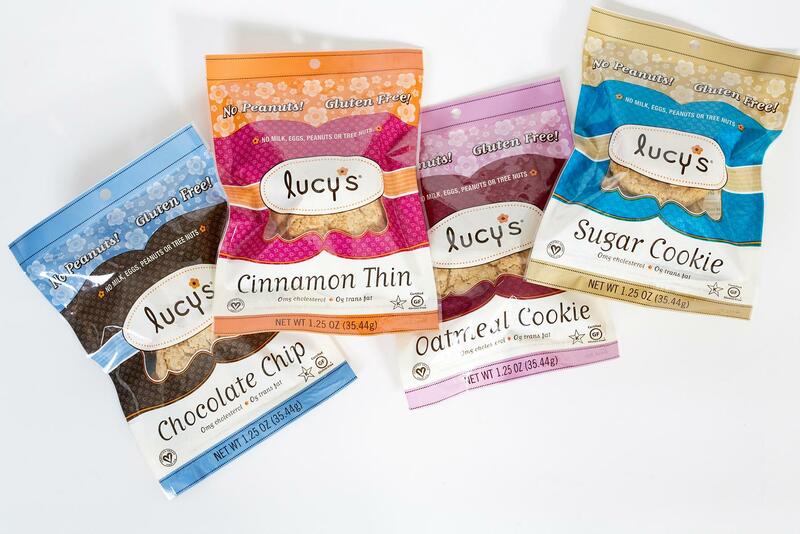 The cookies come in 4 flavors, Cinnamon Thin, Sugar, Chocolate Chip and Oatmeal, and are all natural and mostly organic. They come in individual pouches with 4 cookies in each, or in box format. Each cookie is about the size of a Nabisco Chips Ahoy cookie, and is crispy. They have a light, airy, crunchy feel to them, and are the opposite of soft-baked/chewy cookies. Still delicious, none the less. Read on! Cinnamon Thin– yum! These reminded me of snickerdoodles. It has a nice melt-in-your mouth consistency and had lots of cinnamon flavor. Sugar– soo good. Tasted just like Mom’s homemade sugar cookies during Christmas season. You could totally decorate these with some icing and pass them off as homemade 😉 . They are covered with sugar crystals and have a buttery flavor. The vanilla also added a nice touch. Chocolate Chip– This one tasted like the sugar cookie, but with some chocolate chips. I really enjoyed the chocolate chips though, they were perfect in the cookie, I just wish there were more! There was also a nice mixture of a vanilla/brown sugar taste in these. Very enjoyable and different from the standard chewy chocolate chip. 1 serving (3 cookies) ranges from 120-130 calories, 4.5-5 grams of fat, 18-21 grams of carbohydates, 1-2 grams of fiber, and 2 grams of protein. Cinnamon Thin-Evaporated cane juice*, Dr. Lucy’s Flour Blend (garbanzo, potato starch, gluten-free oat, tapioca, sorghum and fava flours), soy milk*, palm fruit oil*, soybean oil*, canola oil*, olive oil*, filtered water, flavoring and citric acid from corn, crushed soy beans*, soy lecithin*, cinnamon, non-dairy lactic acid, beta carotene, baking powder, baking soda, salt, xanthan gum, calcium carbonate, annatto extract color, sodium carboxymethylcellulose, methylcellulose. Sugar–Evaporated cane juice*, Dr. Lucy’s Flour Blend (garbanzo, potato starch, gluten-free oat, tapioca, sorghum and fava flours), soy milk*, palm fruit oil*, soybean oil*, canola oil*, olive oil*, filtered water, flavoring and citric acid from corn, crushed soy beans*, soy lecithin*, non-dairy lactic acid, beta carotene, baking powder, baking soda, salt, xanthan gum, calcium carbonate, annatto extract color, sodium carboxymethylcellulose, methylcellulose. Chocolate Chip-Dr. Lucy’s Flour Blend (gluten-free oat, garbanzo, potato starch, tapioca, sorghum and fava flours), evaporated cane juice*, vegan chocolate chips, gluten-free rolled oats, soy milk*, brown sugar*, soybean oil*, palm fruit oil*, canola oil*, olive oil*, filtered water, flavoring and citric acid from corn, crushed soy beans*, soy lecithin*, non-dairy lactic acid, beta carotene, baking powder, baking soda, vanilla extract*, salt, xanthan gum, calcium carbonate, annatto extract color, sodium carboxymethylcellulose, methylcellulose. Oatmeal-Dr. Lucy’s Flour Blend (gluten-free oat, garbanzo, potato starch, tapioca, sorghum and fava flours), evaporated cane juice*, gluten-free rolled oats, soy milk*, brown sugar*, soybean oil*, palm fruit oil*, canola oil*, olive oil*, filtered water, flavoring and citric acid from corn, crushed soy beans*, soy lecithin*, non-dairy lactic acid, beta carotene, baking powder, baking soda, vanilla extract*, salt, xanthan gum, calcium carbonate, annatto extract color, sodium carboxymethylcellulose, methylcellulose. Last chance to win some DONUTS and 150$! The giveaway by Holey Donuts! ends DECEMBER 15th. Just visit the website and put MY blog name and website in the subject line, and fill out the contact info. Then leave me a comment. More info provided HERE.